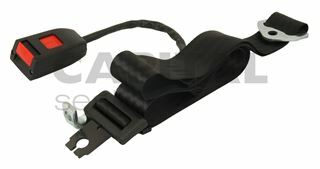 A durable 2-point static extra long lap belt with cable stalk buckle. Suitable for a range of applications including cars, vans, forklifts, tractors, construction machinery and more. The buckle is mounted via a rigid stalk, ideal for keeping the belt in a fixed position for easy location when in operation. This is an "extra long" lap belt kit, typically longer than most standard lap belts, for comfortable fitting in motorhomes, commercial and mobility vehicles.